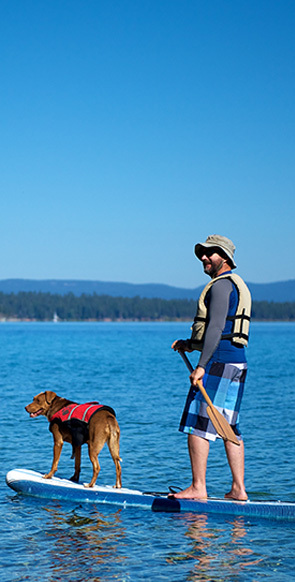 Lake Tahoe snowshoeing is a great family activity that everyone from the youngest to the oldest can enjoy. Many of the winter resorts in the Lake Tahoe area have groomed trails, warming huts, and even cafes along the trails to refuel. Trails are often used by both snowshoers and cross-country skiers, so a certain amount of trail etiquette is necessary. Modern snowshoes are fashioned from space age materials like polypropylene, are often solid (without the traditional lattice work), and have hinged heels called ascenders. Solid snowshoes? Yep! It turns out that in the real world of trekking across the snow the worry about snow covering, and weighting down, the snowshoe was groundless. It just doesn't happen! Unlike skiers, snowshoers don't wear ski boots (too heavy) but rather light hiking boots. Most snowshoers use poles similar to ski poles for balancing purposes. If you're staying at the 3 Peaks Resort and Beach Club, just steps away from the Heavenly Gondola, you'll probably want to start out snowshoeing at the Heavenly Resort's Adventure Peak where up to 4K of snowshoeing and cross-country skiing trails are available. There are even introductory class sessions for newbies. Sierra at Tahoe, located just 12 miles west of South Lake Tahoe, has a groomed three mile snowshoeing trail. Signs along the route describe local flora and wildlife. Serious snowshoers, who want to cover a lot of territory, will find a tremendous number of trails throughout the Lake Tahoe region. Many of the hiking trails in the Tahoe National Forest are also open in the winter to cross-country skiers and snowshoers. On the South Shore the Echo Lakes Trail is fairly flat and an excellent starter trek for beginners. The Little Round Top trail takes snowshoers along a ridge providing almost continuous scenic views. The Mount Tallac climb is only recommended for those with considerable experience as the terrain rises 3,000 ft. in about 2.5 miles, a fairly steep slope requiring intimate familiarity with one's snowshoes.